C21 Live Monitor is an unattended software tool for the monitoring and supervision of audio and video streams. It features mechanisms to establish alerts and protocol analysis, which ensures the correct broadcast of critical contents. The system can be used both in IPTV private networks as well as in streaming protocols environments. Alerts. Identifying and notifying (SNMP, email, audio, visual, call to a remote web service) various types of errors which might appear in the monitored content (loss of audio or video signals, black screen or freeze, silence). Monitoring. The system can be monitored via SNMP, and notify via traps of any anomaly detected. Logs and statistics in real-time. The statistics and log history allows us to record and review the alarms stored in the system. Managing API. Remote interface management via simple and well documented API for remote system management and configuration, as well as integration with third-party elements. Backup. The system configurations management allows a quick recovery or creation of new setups. Remote Support. C21 Live Monitor offers the option of remote access without the need to open entry ports into the security framework that protect the user platform. High monitoring capacity. The system can monitor simultaneously up to 50 streaming signals. Ability to monitoring the most commonly used codecs and IP formats in the market. 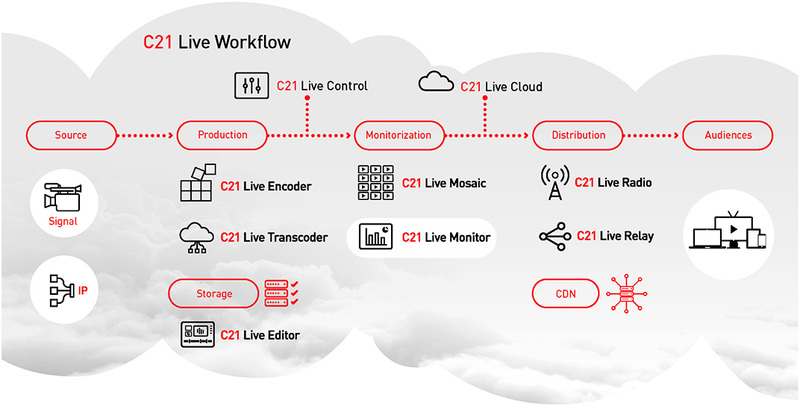 Each video or audio signal controlled by C21 Live Monitor has a completely independent monitoring configuration , thus making it a fully adaptable product for the OTT and OVP markets. Unattended monitoring through notifications (SNMP, email, call to a remote web service) thus ensuring the remote detection of quality loss. Intuitive web management, API and SNMP. Minimizes the efforts needed to manage, monitor and integrate with third-party systems. Integration with C21 Live Cloud services. Opening a new range of possibilities for remote supervision. Diversity in the operating model. Based on the C21 Live Cloud, SaaS service or appliance it ensures an easy fit inany business model. C21 Live Cloud Monitor monitoring service has the ability to monitor multiple video or audio contents of different formats. The cloud service offers the added value of its use in different regions of the world in order to validate the quality of the reception of the streaming content, while it controls the geolocation mechanisms. Encoding resources optimization: the option of activating only what is needed and at the same time vary the amount of encoding resources in real-time. This, as a consequence, opens a new opportunity to new encoding projects for which the investment needed would otherwise be impossible. Global reach: the possibility to enable the encoding resources available in different areas of the world.